I didn’t intend to start a running blog. I actually planned to serialize a novel on WordPress. Plans! But thanks for following my little IPR adventure. And for all the support via Facebook, emails, etc. My favorite response was the blog satire of one of my more whiney entries. I am going to find some more races this fall to maintain the fitness momentum and will continue to publish my exploits. 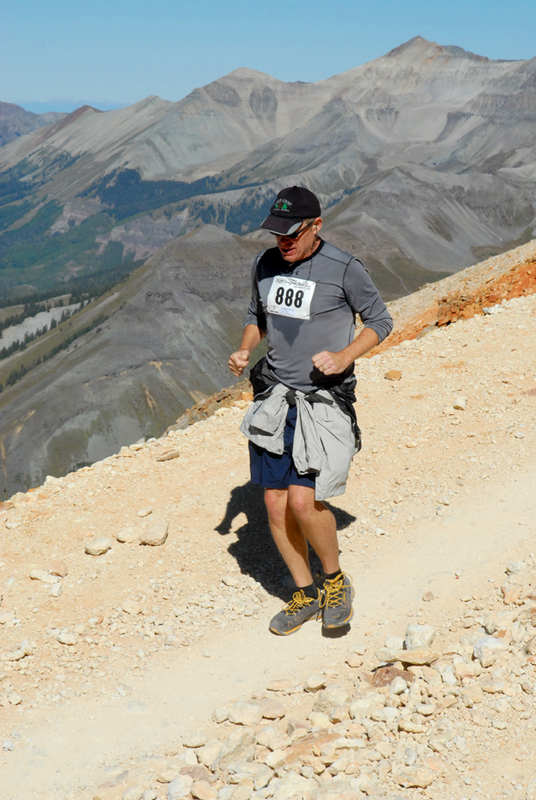 This pic is at the summit of Imogene Pass – mile 10 – just starting the descent. This isn’t some weird camera angle like on the original Batman series – the trail was really that steep. It’s Monday night, two days after my most challenging run in 30 years, and I feel fine. Physically recovered and hungry, blogging from my WordPress for iPhone app and listening to a Singer/Songwriter Genius playlist. I’m sitting in seat 23A on Jet Blue flight 97 with my card ready in my pocket to buy both the beef and cheese snacks plus a Heineken Light as soon as the service cart rolls up. I rose at 4am to fly 4 hours for a 3 hour meeting in NYC. There wasn’t time for much food today and I’m not dozing off until I catch up on my calorie deficit. At least my hamstrings aren’t cramping like they did on the flight out. I’ll get home after midnight, a 20 hour work day driving American productivity by marginalizing my salary – but it’s all good. Looking forward to resuming my regular routine of the basement commute, early morning calls and launching Ellie off to school. The IPR was an outrageous goal that accelerated my fitness regimen by light years. Tomorrow I will google a fall marathon to keep the running routine active.